Why not commission a story to match David's superb images? Traditionally conservative Chile and its one-time capital of stodge, Santiago, is emerging from the shadows. Chileans, thanks in no small part to new arrivals from the rest of South America and the world, are experiencing something of an 'awakening' in the form arts, architecture and culture. Driven underground by oppressive governments of the past, subversive, left-wing elements are now much freer to express themselves and this new-found freedom is slowly transforming the city into a more vibrant, even edgy metropolis. Rod sets out to see something of the Santiago underbelly, and with long-time resident and English ex-pat, Gary James of Sense Chile, elbows his way through crowded markets, spills his 'terremoto' at La Piojera and even stops by for a racy cappuccino at one of the city's 'café con piernas', literally 'coffee with legs'. As part and parcel of this urban arousal is a new wave of boutique hotels: small city enclaves of just a dozen or more rooms. 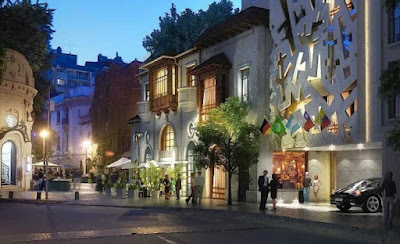 We visit four such properties, including Santiago city's newest hotel opening, a renovated 1928 building in the trendy Lastarria neighbourhood designed (and now named after) one of Chile's most famous architects, Luciano Kulczewski.